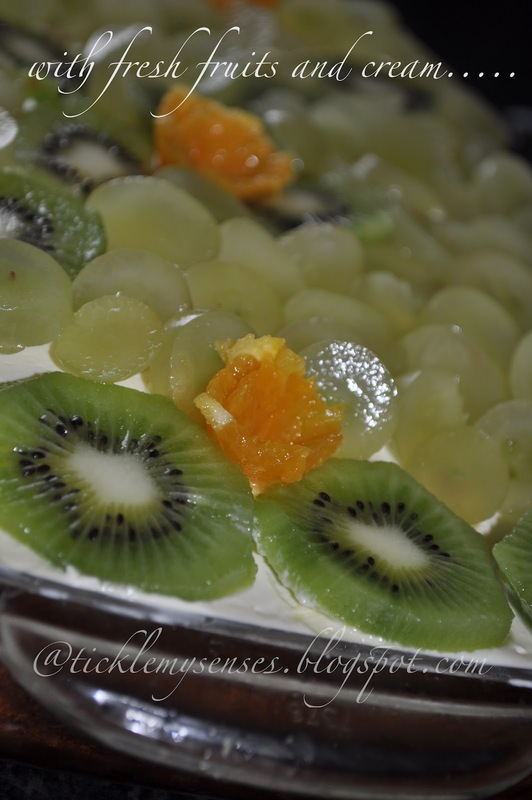 Tickle My Senses: TresLeches Cake and Happy Fathers day. Its Fathers Day today and I present this supermoist, milky nectar laden cake to the two most special men in my life. One who is responsible for what I am today " My Dearest Dad" thankyou dad for all your sacrifice, endearing love and never ending support. I love you. and to " My Sweet Hubby" who is my love, my life and wonderful Father to Baby A. I love you. May God Bless you both abundantly and fill your lives with good health, happiness and peace. Also not to forget all other fathers out there, who are true dad's to their children and who make a difference to their lives. Happy Father's Day to you all. Coming to the recipe for today. This unique, light and delicious cake makes an unforgettable eating experience. Each mouthful of this cake bursts with milky nectar. Known as the`Tres leches cake, or Pastel de tres leches, meaning the "three milk cake". It is a sponge cake or a butter cake which is soaked in three kinds of milk which is Evaporated, Condensed and Whole Milk. Simply delightful. Milk lovers will relish every bite of this cake. The origins of this cake is disputed. It is very popular in Latin America and Spain. The Nestle company claims to have helped the tres leches recipe evolve, during World War II. Some Europeans believe its theirs ??? Who knows...who cares as long as we can all enjoy it. I prefer to add fresh fruit to the topping as it makes this cake cool and refreshing. 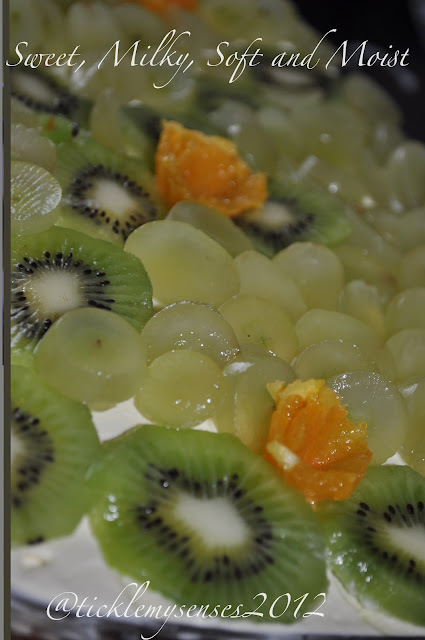 I used a couple of Kiwis, seedless green grapes and oranges. The recipe below is taken from Allrecipes.com. It is highly rated recipe and has received hundreds of very good reviews. Do try it out. Any sliced fresh fruit of your choice. 1. Preheat oven to 350 degrees F (175 degrees C). Grease and flour one 9x13 inch baking pan. Sift flour and baking powder together and set aside. 2. Cream butter or margarine and the 1 cup sugar together until fluffy. Add eggs and the 1/2 teaspoon vanilla extract; beat well. 3. Add the flour mixture to the butter mixture 2 tablespoons at a time; mix until well blended. Pour batter into prepared pan.Bake at 350 degrees F (175 degrees C) for 30 minutes. 4. Once done take out of the oven and pierce the cake several times with a fork. Combine the whole milk, condensed milk, and evaporated milk together. Pour over the top of the cooled cake. 5. Whip whipping cream, the remaining 1 cup of the sugar, and the remaining 1 teaspoon vanilla together until thick. Spread over the top of cake. 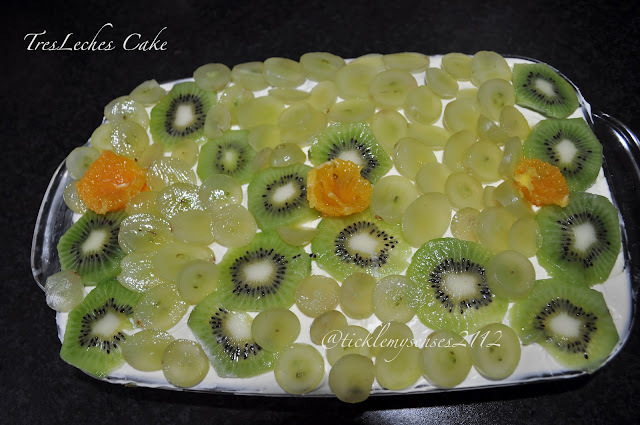 Decorate with freshly cut fruits. Keep the cake refrigerated. Eat within 2 days. Enjoy! Will upload a picture of the cut cake soon. A soft and creamy cake and the lovely fruit topping.